Chinese scientists have recently uncovered new clues about the origin of the world-famous "terracotta army" of Emperor Qinshihuang, the first emperor of China's Qin Dynasty (221-206 B.C. ), determining that the horses were made near the mausoleum, but the warriors themselves were constructed elsewhere. 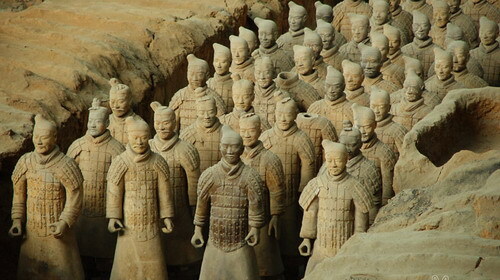 This conclusion was reached after an analysis of pollen in the clay of the terracotta army. Scientists from the Institute of Botany in the Chinese Academy of Sciences studied the clay under a microscope and identified 32 different kinds of pollen grains. "The pollen found in the horses was similar to that of Qinshihuang's mausoleum, but the pollen in the warriors was quite different," Hu Yaqin, the leader of the research project, said. According to him, the pollen found in the warriors came mainly from herb plants, such as mustard and cabbage, and plants like sagebrush, wormwood, quinoa, spinach, beets and chard, while the pollen in the horses came from trees such as pine, kamala and ginkgo.